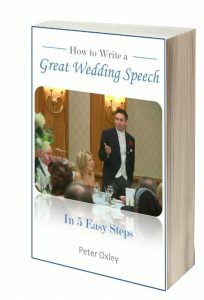 Find Out How You Can Write a Great Wedding Speech - In Just 5 Easy Steps! Enter your email address below to get your free e-book delivered direct to your inbox. Often the biggest hurdle with wedding speeches is knowing how or where to start. Even if you’ve done tons of public speaking before, a wedding speech can seem really daunting when it comes to sitting down and putting pen to paper. As an extra special bonus cheat sheet, my wedding speech template which will get you from a blank sheet of paper to a fully drafted speech in just a matter of minutes - even if you’ve never written a speech before! All you need to do is click “Send Me My Free E-Book!” and you’ll get instant access to this amazing guide!